GLORY's compressed air duster "Recycle Jet" received the excellence award at the "18th Grand Prix Contest for Ozone Layer Preservation & Global Warming Prevention" on August 28, 2015. This Grand Prix Award, backed by the Ministry of Economy, Trade and Industry and the Ministry of Environment in cooperation with the Japan Refrigerants and Environment Conservation Organization, has been given by Nikkan Kogyo Shimbun, Ltd. to the companies, groups and individuals who have been contributing to preserving the ozone layer and preventing global warming. 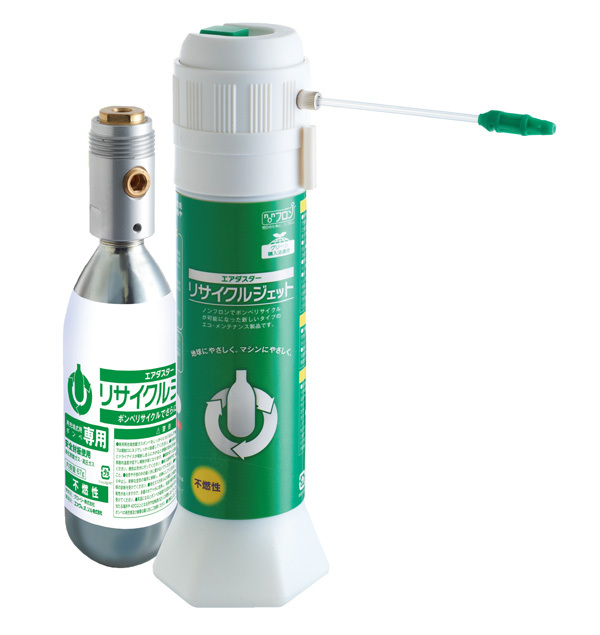 GLORY's newly developed compressed air duster "Recycle Jet", accommodating a reusable and detachable cylinder filled up with injection gas of carbon dioxide generated through industrial by-products, is used for cleaning and maintaining electrical goods, precision apparatus etc. This product helps reduce waste materials and carbon emissions through minimizing the global warming potential to as little as 1/1430 of the conventional product and by utilising the reusable cylinder. We have also established an environmental conservation scheme for collecting used cylinders at more than 100 nationwide service network points during routine maintenance works, and also for refilling the injection gas at affiliated facilities. This way, we have also reduced the emission of greenhouse gases. We will promote environmental conservation activities through utilising our own strength jointly with our customers, aiming for the prevention of global warming and the establishment of the circulation-type society.